Sotheby's auction house in London says that this is "the first time in auction history that a work of art automatically shredded itself." 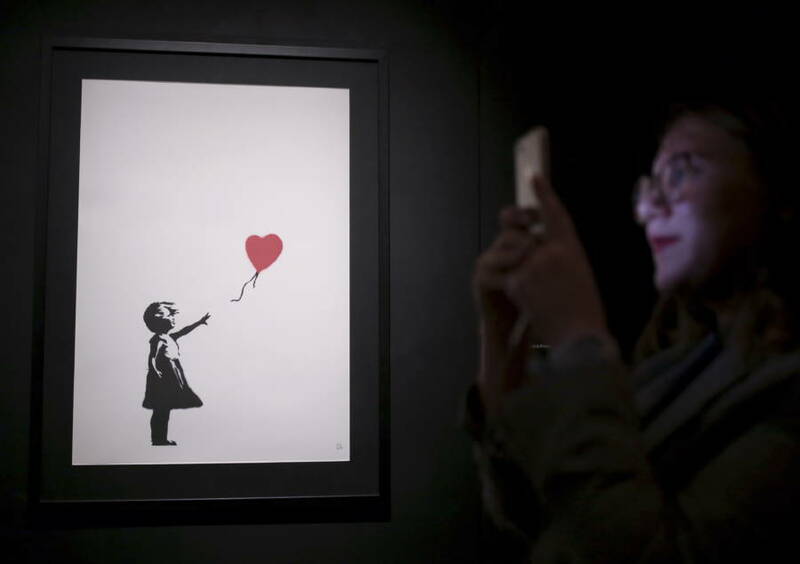 Anton VaganovTASS via Getty ImagesA copy of Banksy’s “Girl With Balloon” mural on display. 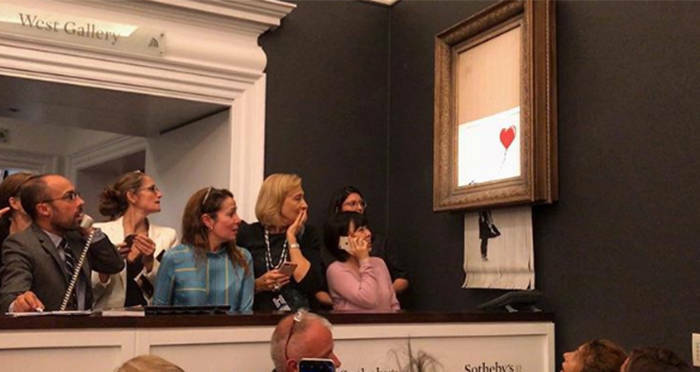 Art fans at an auction house in the United Kingdom were left stunned after a Banksy painting self-destructed immediately after it was sold for $1.4 million. A hidden shredder inside the painting’s frame went off shortly after the work was sold at Sotheby’s in London on Oct. 5. The work was pulled down through a shredding mechanism at the bottom of the frame, ripping it into pieces. The painting is a reproduction of one of the most iconic graffiti murals Banksy has ever produced. The original version of the image was spray painted onto a building in East London back in 2002. It was removed in 2014 after it had been covered up by boards for a number of years. Several iterations of the painting have since been sold, but none have been destroyed like the one at Sotheby’s has. After the public witnessed the jaw-dropping demonstration, Banksy explained the stunt on social media. He wrote that he had secretly built the shredder in the painting a number of years ago in the event that it was put up for auction. When that day finally came, his elaborate stunt was realized, leaving auctioneers speechless. “It appears we just got Banksy-ed,” said Alex Branczik, head of contemporary European art at Sotheby’s. Purchased by an unidentified buyer via a representative over the telephone, the auction house has stated that they are currently in discussions with the said buyer as to how they’ll proceed with the sale. Although it’s unclear how Sotheby’s will approach the situation, some believe that this painting will be worth even more now shredded than it was while still intact. Watch for yourself as the work self-destructs. Others are questioning the authenticity of the stunt. Dan Chrichlow, creative director of the creative management agency Dutch Uncle, says that he believes that the auction house was in on the scheme. Authentic or not, it seems unlikely that any buyer would shell out over a million bucks just to see their new piece shred itself. Next, read more about Banksy and his role in the guerilla street art movement. The, check out this story about Dran — France’s answer to Banksy.